We deal in providing Portable Site Offices and Cabins in wide range. we manufacture the executive chambers as per the plan. We come with a whole list of amenities including air-conditioning, lockable storage cabinet, windows with heavy duty security shutters, insulated roof, power, phone and connectivity all are ready to use at any given point of time. 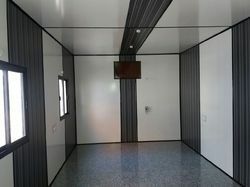 We are a Portable Cabin manufacturer with an eye on quality of the product and educating the customer to buy quality product for life time. 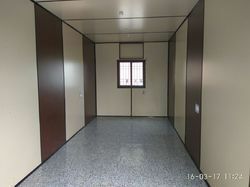 We are manufacturing portable and Modular Office Cabins for different uses. We design cabins that are built as per the customized requirement of our clients. These Prefabricated Modular Cabins are available in various sizes and shapes. The Modular Cabin is a convenient way to settle immediately into the sites in remote locations. We serve a very useful purpose for the construction companies. We provide good, well constructed and well equipped cabins according to the requirements of the customers. Portable Cabins come in different sizes supplied by different manufacturers based on the requirements of the end customer. The Porta Cabins we manufacturer are containerized lift and shift type for flexibility in usage. We provide Portable Cabins for the purpose of Offices, Houses etc. The Portable Cabins are an excellent option for Housing, Office solutions and are gaining popularity day by day in India. Awareness amongst clients is growing manifolds daily. Our range of Portable Offices is ideal for containerized offices, living modules with in-built built arrangement for lifting by hooks and cranes. These are offered with total electrical wire fitting and option to plug in external source for electricity, sliding windows as well as optional mosquito screen, self locking doors, provision for AC, DG sets, bulb and headlights offered with optional modular workstations, study tables, storage racks and water coolers. The Portable Offices we provide are robust in design and longer life to withstand variable temperatures throughout the year. Our Portable Site Office is essential for those customers who execute their work on different locations / sites. They can mount the cabin either in temporary or permanent basis and after execution of their projects / work they can dismount the same without any destruction. The Site Office we are offering comes ready with host of safety and effective features which make life of user comfortable. Our Portable Site Office Containers or cabins are temper proof and are resistant to all sorts of climatic change providing secure and comfortable working scenario. These containers are also very economical, par excellence in quality and easy to transport from one site to another without any requirement of any sort of skilled labor. The Office Portable we are providing is of best quality with Layout and specification finalized by Client. We design Site Cabins depending upon the clients’ requirements. Completely safe and are easy to install. These structures add sophistication to your office and yet are very inexpensive without any compromise in its quality. The Site cabin we manufacturer is for immediate acquisition by client and caters to a host of different applications including Office, Accommodation, Toilet, Kitchen, Cafeteria, etc. We manufacture Portable Site Office Cabins and bunkhouses cater to the needs of clients doing activities such as construction sites, road projects, housing projects, engineering projects etc. These offices have a large life of up to 20 years depending upon the maintenance & up-keep which varies from client to client. We are providing Site Office Cabin which are best in class and cater to the need of lots of customers with value for money features. We manufacture Portable Containers which are the ideal choice for those who are looking for crew cabins or mobile office. Those companies who run number of projects in same time can use the container for Business Conference, staying for their executives or for also employer who can stay in luxurious style on site without paying any luxury charges. The Portable Cabins we manufacturer are robust and secure for longer duration in tough weather conditions. 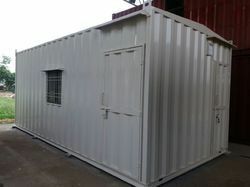 A very common request is to convert containers to site offices, mess room, or storage cabins. 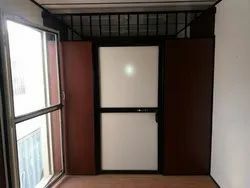 Armored and normal personnel doors are commonly fitted into the sidewalls of the container. However, in the example below the customer decided to use the original doors for security and had an internal bulk head fitted just behind them, with a wooden internal door. Portable Office Containers are a one stop solution for immediate need of an Office and are available ready stock in different sizes.